This recipe is from Jamie Oliver’s 15 Minute Meals. 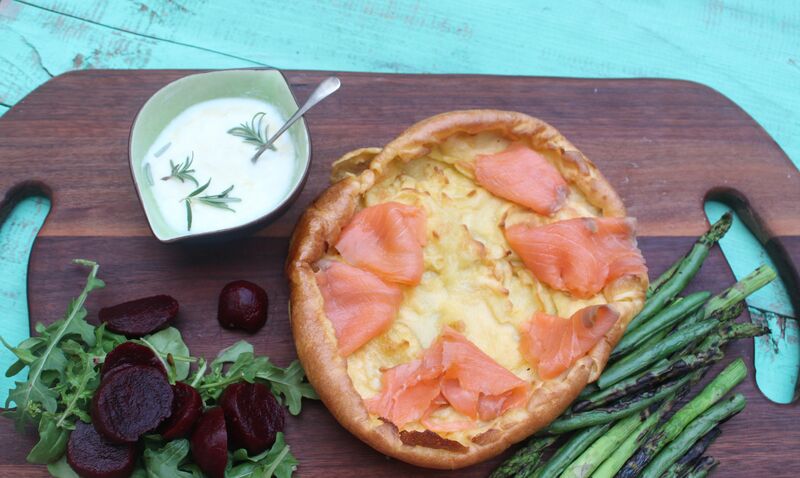 It’s basically a big Yorkshire pudding with smoked salmon, char-grilled asparagus and baby beetroot, with a yoghurt sauce. I added some char-grilled green beans. I simply served the cooked beetroot as is, without caramelising it as Jamie suggests in his recipe. Jamie cooks the Yorkie in an oven proof frying pan; I don’t have one (yet!) so I cooked it in a cake tin, omitting the first step of cooking the batter in the frying pan on the stove top. It’s a great recipe – really easy and super fast. Maybe not quite 15 minutes – but not much more! Preheat oven to 200 degrees C. Put 2 tablespoons of olive oil in a medium sized cake tin and place in the oven and heat till the oil is really hot. Put the eggs into a blender or food processor, add the milk and flour, then blitz until smooth. Carefully pour the batter into the hot cake tin and cook in the oven until golden (about 12 minutes). Don’t be tempted to open the oven door! Trim the asparagus and beans and put dry on a hot char grill plate or barbecue, turning until nicely charred on all sides. Drain and slice the beetroot, then place over some salad greens on a board or plate. Mix the yoghurt and horseradish or mustard in a bowl, then season to taste with salt. Squeeze lemon juice over the asparagus and beans, add salt and pepper, and pile on the board or plate. 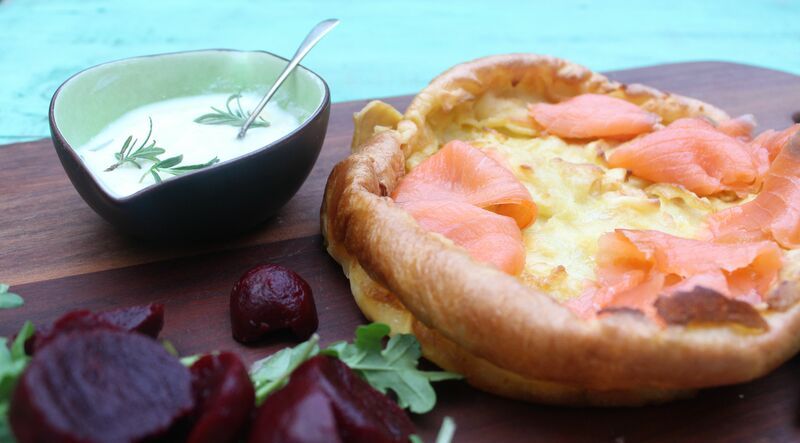 When the Yorkshire pudding is really high and puffed up, remove from the oven, slide it on to the board or plate and place the smoked salmon on top of the pudding. 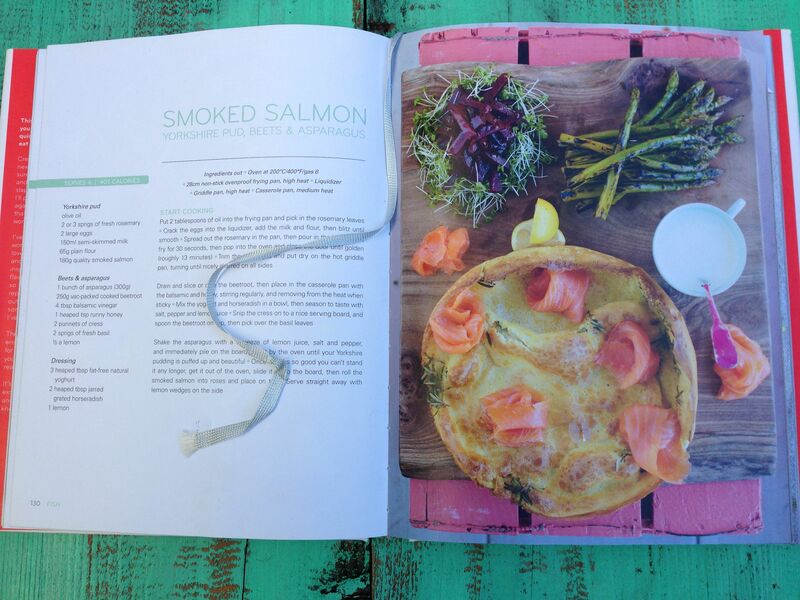 Posted in Fish, Jamie Oliver, Savoury Food and tagged 15 Minute Meals, Jamie Oliver, smoked salmon, Yorkshire pudding. Bookmark the permalink. Pingback: 15 Insanely Delicious Yorkshire Pudding Recipes - Do You Still Hate Me? Your horseradish and low fat yogurt sauce rocks Jamie! How did you come up with an idea like that? This is a sauce that would go with anything and everything, fair play!!! !